Time and time again, we’ve noticed some confusion between credentialing and enrollment. And to a degree, the blurring between the two is completely justifiable. They overlap one another in numerous ways — making both processes seem complex in nature. The overlap between credentialing and enrollment begins on a data level. Not only does much of the same data have to be reviewed by a lot of different people within an organization, but there is no standard process to acquire (or deliver) that information to the appropriate individuals. It can get downright messy! Below is a list of the main differences between credentialing and enrollment. Credentialing is the in-depth process of verifying a provider’s identity. A Certified Credentialer will review the providers qualification and career history which includes their education, training, residency, licenses, as well as any specialty certificates. Enrollment and Credentialing are both time-consuming and while both consist of roughly the same amount of information, managing and maintaining a balance between the two is vital. Text text text text Text text text text Text text text text Text text text text. 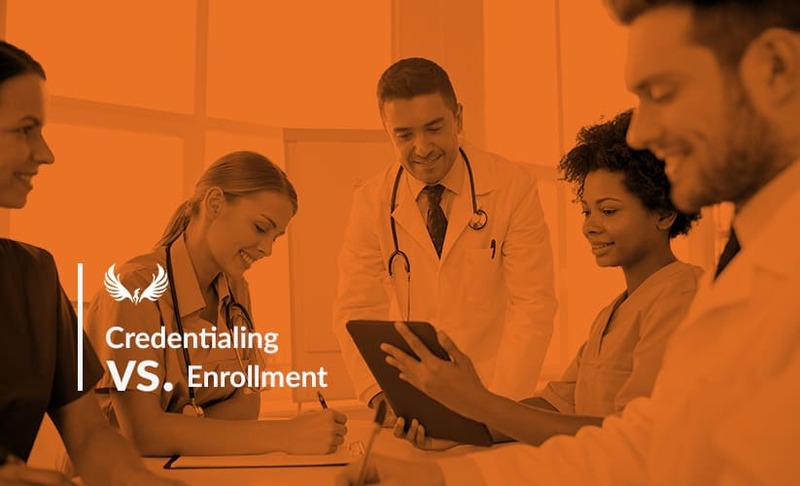 As part of the enrollment process, a provider needs to be credentialed with a payer prior to the start of enrollment. Time is money so the sooner the information is provided, the sooner enrollment can begin. Text text text text Text text text text.